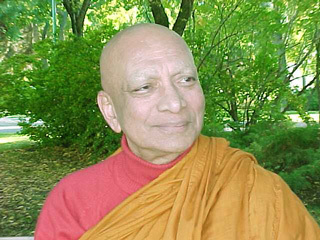 Bhante Madawela Punnaji (November 26, 1929 - July 27, 2018) from Sri Lanka was a scholar of the Pali Canon and also had extensive studies in science, medicine, and western psychology. He wrote the Foreword to author Dr. David N. Snyder's Buddha's Lists and has written and presented several other articles around the globe as well. Born Pushpananda Madawela, Ven. Punnaji began meditating when he was five years old . As he grew up in Sri Lanka, he began getting interested in Buddhism while other children were starting school. Ven. Punnaji's ancestry traces to Herat Mudiyanselage Madawela Basnayake Nilame (1830), whose son was Sri Lankan politician Godfrey Edward Madawela (1878 - 1932). Ven. Punnaji's brother is Godfrey Ernest Madawela, pictured here. After the passing of the late Ven. Dr. K. Sri Dhammananda at the Brickfields Malaysian Buddhist Maha Vihara , Venerable Punnaji traveled there to give the eulogy for K. Sri Dhammandana and was such a good a teacher of the Dhamma that he was asked to stay, which he did. Ven. Punnaji has frequently visited Las Vegas, the Vipassana Foundation and wrote the forward to Dr. David N. Snyder's book, Buddha's Lists. ↑ Chai Mei Ling. "A scientific approach to religion". BuddhistChannel.tv. Retrieved on September 28, 2008. ↑ Githal Madawela. "Madawela Family Tree". Retrieved on September 28, 2008. This page was last edited on 12 September 2018, at 19:54. This page has been accessed 239,078 times.